Let’s be honest. If you are in the real estate industry and you regularly come across appraisal reports, do you really read them? If you’re like most people, you simply look at the bottom line value in the report and then call it a day so long as the numbers work. While that makes sense to a certain extent, why not learn how to quickly scan an appraisal to look for quality? This can help you and your clients know that the value is solid, but also help you challenge a bad appraisal too. Over the next few weeks we’ll be looking at top items to review in an appraisal report. I’ve split this into several posts so it’s easier to digest, and at the end I’ll include one example report with all of these items highlighted. In the mean time, you can subscribe by email to get future posts delivered to your inbox. 1. One Unit Housing Trends: This is a section on Fannie Mae’s appraisal report on the first page of the report. It gives the appraiser the opportunity to characterize the direction of property value in the neighborhood, the amount of housing supply on the market and how long it takes properties to sell. If a different form was used for a non-lending appraisal, the appraiser should still comment on these items, but there is no little box to check, so you’ll need to scan the report to find where the appraiser might have discussed the market. Why does this matter? If this section is not filled out correctly, the appraiser might not understand the market. As an example, consider the box above in Carmichael, which is a census-designated place in the Sacramento area. Values have been increasing, there is an undersupply of listings and properties are selling in very short periods of time, yet this report stated values were stable, supply was balanced and it is taking 3-6 months to market properties (all not accurate). If the fundamentals of the market are clearly incorrect, maybe other things like comp selection and adjustments are also inaccurate. 2. Neighborhood Boundaries: It’s so important to know exactly where one neighborhood ends and another begins. Misunderstanding neighborhood boundaries can have a dramatic impact on perceived property value. The Fannie Mae appraisal report form is used for most lender appraisals, and it asks the appraiser to identify the neighborhood boundaries on the first page of the appraisal report. The section looks just like the box above. The example above is perfect in that there is a huge difference in value between West Tahoe Park and the portion of Oak Park that is just west of this area. Stockton Blvd acts as a “line of demarcation” in this market, so “comps” really shouldn’t be borrowed across the street since these are two distinct markets. Even more striking is the “Med Center” boundaries outlined in red. There is a huge value difference between properties located inside and outside the Med Center boundaries. 3. Market Conditions: The Fannie Mae report asks the appraiser to discuss the conditions of the neighborhood real estate market and give support for the direction of property values, marketing time and inventory levels. In many cases this section of the appraisal report in a bad appraisal will include very limited information that is basically text that is transferred from one appraisal to another. Ultimately if this portion of the report includes erroneous information, we’ll have to wonder if comp selection and adjustments are going to be bad also. This section is often far too thin in shoddy appraisal reports, but it is actually very important because it should give the reader an idea of the trends in the neighborhood. On a side note, I have been giving great attention to describing the market in my reports, especially since values have been increasing rapidly in some areas. In future years when loans go into default, and the lender is looking for somebody to sue, I want them to see that I gave a detailed description of the volatility of the market. 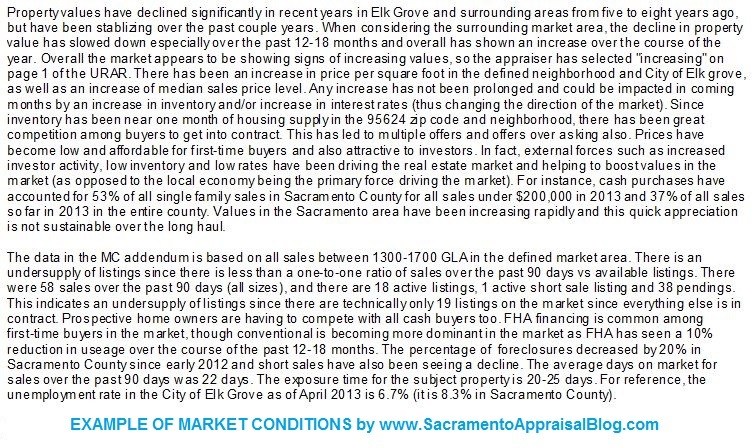 If put on the stand in court, I will at least be able to say, “Did you read the appraisal report?” or “Did you read the section where I talked about rapid appreciation being unsustainable?” Click on the thumbnail for a recent example during an Elk Grove appraisal. Any questions or insight? Feel free to comment below. What do you think of Curtis Park Village? Big news broke yesterday as the “Curtis Park Village” site is now ready for construction. I’m amazed to read that over 358,000 cubic yards of toxic dirt was removed from the site to prepare for future residential and commercial building. By the way, does anyone know where the dirt went? I’m really interested to see how the new “Village” compliments the historic Curtis Park neighborhood. Curtis Park has such amazing character, so I hope the builders will be as sensitive as possible to the quality and craftsmanship found in the neighborhood. Whatever the case, as long as the builder does a decent job, my guess is these units are going to be a very hot commodity because of the great location and close proximity to Downtown. – See also Sierra Curtis Neighborhood Association and Curtis Park News. I’d really like to hear from Sacramentans on this matter and especially Curtis Park residents. How do you feel about the development? What are the positives? What are your concerns? The SacBee article seemed to indicate that residents are “cautiously optimistic” about the project. If you are a resident, do you feel that way? Have you ever felt like you need to do a blog post, but you just don’t know what to write? I’ve been there many times, so I wanted to share a resource I created that helps me avoid this feeling by keeping 10-20 post ideas in front of me at any given time. The document below hangs in my office, and I use it to jot down post ideas whenever I have them. This system is simple and it’s worked extremely well for me to be more organized, save time and stay focused on my target audience. Download “How to develop blog content” and start writing down some ideas. I hope this is helpful, whether you have a real estate blog or write about something else. By the way, if you’re in the real estate industry and looking for some general blogging tips, check out Quick Tips for Real Estate Blogging. How do you plan posts? Could you see yourself using a resource like this?